One Direction has released their brand new video for their single ‘One Thing’. The video is filmed in London and sees Harry, Niall, Zayn, Liam and Louis travelling around the city on an open topped bus. The band then stop at Trafalgar Square and put on a gig. 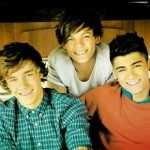 The single ‘One Thing’ is from the band’s debut album ‘Up All Night’.